Author: Andy Daniel ~ Publisher: Enginuity, 1998 ~ Find It! Tilez! 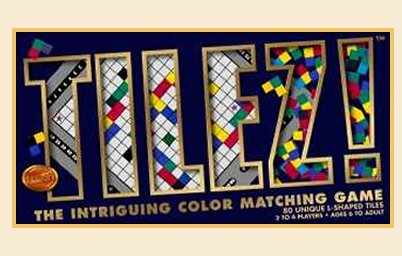 is a color-matching and spatial relations puzzle game that comes with 80 all-different "L"-shaped tiles. The object is to select a tile from your rack and place it on the board such that it matches as many existing neighboring colors as possible. As the game progresses the board becomes a mosaic of color with ever-greater challenges and ever greater opportunities to score.